During hot summer days, the temperature of the pond water may rise to as much as 25 °C. Water of this temperature can contain 30% less of oxygen than water of 10 °C. Especially when there is a large number of fish, lack of oxygen may occur. The fish are in the surface layer of the water, gasp for air and are slow in their movements. The solution? 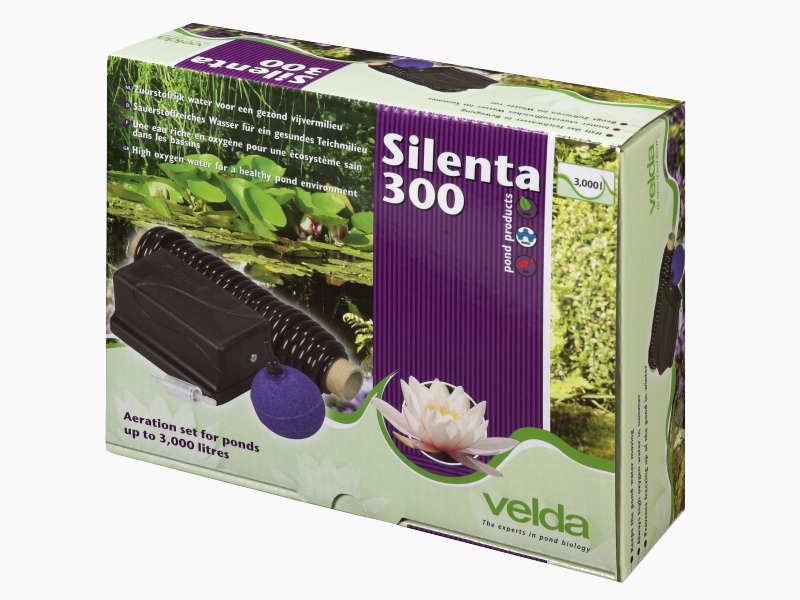 A Silenta aerating set, which can also serve as freezing preventer in winter. In winter death of fish occurs regularly when garden ponds freeze over. Especially in small and shallow ponds there is a great risk that, after freezing, choking will occur. Aeration will produce oxygen in the first place, however, it will also prevent the pond from freezing all over. To obtain a proper biological environment, in which fish and plants will thrive excellently, it is necessary for many garden ponds to apply an aeration unit in the water. Aeration will produce oxygen and keeps water moving, thus allowing optimum bacterial development and a correct equilibrium in the pond. If temperature rises in summer, lack of oxygen is on the look-out. Aerating is a good solution then. 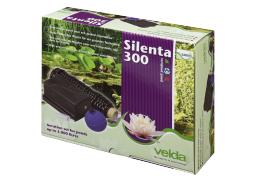 With the help of the Silenta 300 aerating set you can aerate your pond in a simple way and at relatively little money. The high-grade aeration pump of European origin has a high air yield and a long lifetime. 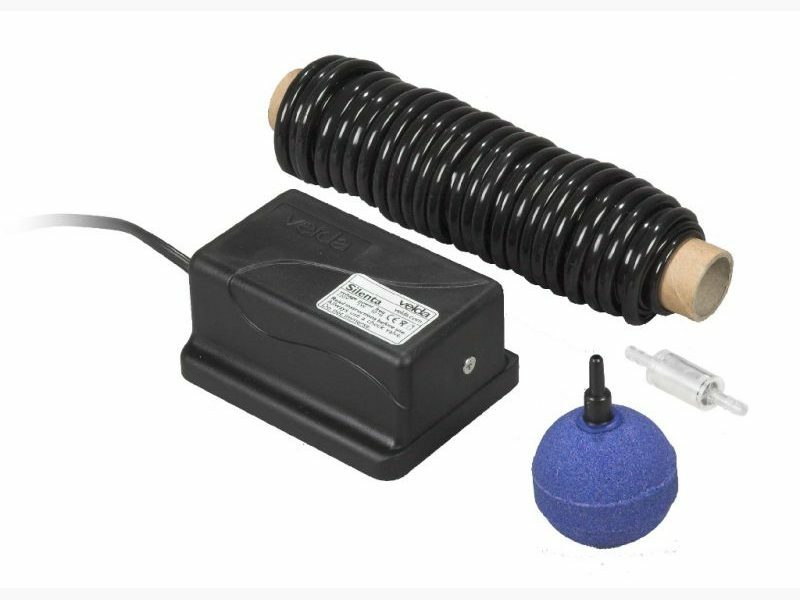 The aeration stone, which is supplied along with the aeration pump should be put about 30 cm below water level. The aeration pump should always be placed in a dry place, for example in a garage. 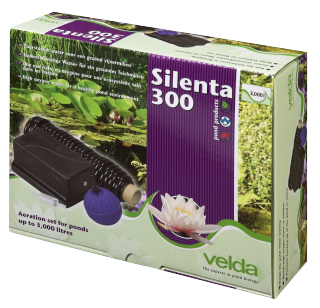 With the help of the Silenta 500 aerating set you can aerate your pond in two places in a simple way and at relatively low cost. The high-grade aeration pump of European origin produces much air. It has a long life time. Both aeration stones, which are supplied along with the aerating set should be placed about 30 cm below water level. The aeration pump should be positioned at any rate in a dry place, for example in a garage.